Making Sense of College Grades: Why the Grading System Does Not Work and What Can be Done About It explores the phenomenon of grading in U.S. higher education, and exposes the systemic faults and cultural baggage that ultimately work against education. From the nation's first recorded grade point average through current practices and policies, this detailed exploration of grades as both motivators and measures of success offers unique insight into today's higher education standards. 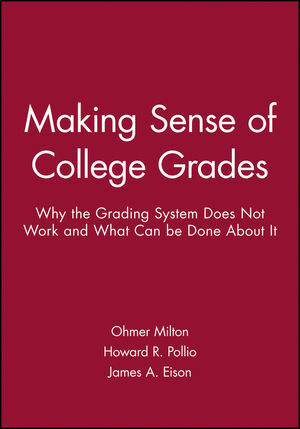 Ohmer Milton and Howard R. Pollio are the authors of Making Sense of College Grades: Why the Grading System Does Not Work and What Can be Done About It, published by Wiley.